Here's a new PERFORMER - more photos are available to see in the Showroom section of our website. It is the new lattice-braced double top design Kenny's developed at a significantly lower cost than the SIGNATURE line. These feature the same double-top design as the SIGNATURE model with European spruce/Nomex/Western red cedar as the soundboard components. The PERFORMER also features sound ports found on the SIGNATURE. Play one of these, and you will be pleased with the power and sweetness of this new model. These will only be available directly from us. 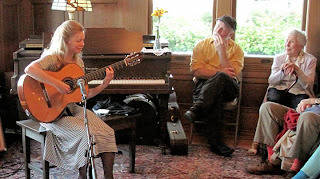 Recently Hill Guitar, along with The Darling House and Waterbird Entertainment sponsored a house concert featuring guitarist Muriel Anderson. Velzo catch up with her expansive garden, and she suggested that while she’s in town she should do a house concert. I agreed to try it out, especially if she could play on my guitars, and she graciously agreed. I hadn’t put on a concert like this before, but it was a good opportunity to try it out. Santa Cruz. The setting couldn’t be more beautiful, and the great room of the Darling House is a perfect place for a guitar concert. Muriel is a natural entertainer. She is a fine classical guitarist, but her taste in music is a completely eclectic romp through styles including Spanish masterpieces, Chet style picking, Japanese music, Brazilian music, a Souza march and several of her own compositions including one that was just days old, untitled, with the audience being solicited for suggestions. We’ll see if any of these suggestions stick. I loved the way the guitars and the music sounded. I’m playing them every day, so I’m in close contact, but it’s gratifying to hear others really making them sing. It’s sentimental. Muriel was joined by singer Rebecca Sayre at the end of the first set and beginning of the second, and Darrel Darling read a poem in tribute to his wife and their special life together at this magic place over the past 25 years. I must recognize Steve Palazzo for the hand he played in getting the word out, not to mention providing the chairs. In the future I hope to bring in more artists who are playing my guitars, and others too. Darrel Darling is a natural big thinker, and he imagines musicians and poets and artists of many types coming through there year round. It’s a grand idea and a fresh reminder that for some of us anyway, the music is what it’s all about, and this is where it’s best, right in the middle of our lives. Earlier this year I began experimenting with lattice bracing as an alternate to the modest fan bracing that I have been using on my Signature Guitars for years. This came about after playing a guitar made with lattice by a dear friend, and I really liked it. I am far, far from finishing my experiment with this, but I want to offer an update of my reactions thus far, and those of the clients who are now playing these guitars every day. It’s interesting. The first three experiments were simple re-tops of existing guitars — I just pulled the old tops off and replaced them with double-tops braced with lattice. The results were intriguing. The first thing they had in common is a big bass, and a mysterious sustain to them, but also my first impression was the sound was a little edgy. I kept these guitars around while I built a from-the-ground-up Signature, in which I also modified several other features, increased the fingerboard elevation, and made the body bigger in particular. This new Signature Guitar right away was impressive. It has a huge sound, a kind of explosive attack and very quick response. And it sounds lovely besides. In the mid range, like around the second and third strings first position, it is more hollow sounding than I’m accustomed to liking, but I wound up playing this guitar as my personal instrument for a couple of months, and I learned to work with this character in a pleasing way, and I must say, when I sold this guitar, I really missed it. In the mean time I went back to the original re-tops, and they had changed dramatically. I’ve experienced this before, when a guitar hangs around for a while without being even played much, and it goes through a metamorphosis. These re-tops were surprising. The edginess was gone, and the expressiveness was excellent, and they played very quick. Each of these guitars has now been sold, and the players are reporting back with great reviews, and their friends are calling and asking where they can get them. I heard Rob Weller play one in a concert at Longay Conservatory of Guitar a few weeks ago, and the sound jumped off the stage. Any questions about its “guitar sound” vanished, because it sounded beautiful and fully present. It was used in an ensemble, and there was no doubt in it’s ability to stand out. inaccurate impression came about because Smallman and his followers popularized this bracing, but those guitars also have many other very heavy features, with an enormous cabinet-like plywood framing structure and a very thick arched back. Smallman guitars are indeed very heavy, something that characterizes them in a world apart. Nor does lattice mean carbon fiber. Balsa wood lattice capped with carbon fiber is the common application, but I can’t stand the carbon or the epoxy used to build this. I’ve just used light weight red cedar for the bracing, and it feels and smells wonderful. I am putting the lattice on a double top. Some other guitar makers have critiqued the idea as redundant, and I too thought that to begin with. A double top is in a way an extension of the lattice engineering, using a thin skin, a lightweight geometric support (nomex) and a lightweight stiffener. But regardless of how you — or I — think about it, I am getting good results, and that's what counts. Some players are attracted to the idea of both double-top and lattice because they want it all. It’s like having an amp that “goes to eleven” , or a “sandwich with both French and rye”, and maybe it’s true. Double Top and Lattice are like two brands, sometimes competing for position as THE “modern” design. In my experience this dual combo is a sporty variation that has a real kick to it. I still won’t say it is going to replace my fan bracing, but I will say I like it — a lot. At the moment I’m finishing up another set of instruments that have double-top and lattice, but with a traditional body, that is, without the elevated fingerboard, laminated sides etc. It’s just a traditional classical guitar body and look but with double-top braced with cedar lattice. I do include the sound ports. These guitars are aimed at making a somewhat simplified, and somewhat more affordable guitar, so that I can get them into the hands of more active players, and see how they do in the real world. This model has the potential to go into production and become more generally available, but these things do take time. The Signature Model continues to be my baby, and even seems to be getting better. It’s not too much trouble to simply alternate the bracing and get alternate results. My Signature Guitar is still a work in progress, and I kind of hope it always will be. I’m still not sure how far this will go, but it’s still going. So the update on lattice bracing and Hill Guitars is — the jury may still be out, but they are smiling.